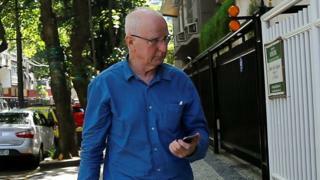 A Brazilian prosecutor has laid charges against Ireland's former top Olympic official Pat Hickey over an alleged Rio ticketing scam. Marcus Kac has passed charges against Mr Hickey and fellow Irishman Kevin Mallon to a judge, who will decide whether to accept or reject them. The prosecutor accused Mr Hickey of four offences including ticket touting and acting as part of a criminal organisation. Both men have denied any wrongdoing. Mr Hickey and Mr Mallon have spent time in Rio's notorious Bangu Prison but were released on bail in August. Mr Hickey, 71, has formally stood aside as president of the Olympic Council of Ireland and European Olympic Committees' president during the investigation. Mr Mallon is the Dublin-based director of THG Sports, a corporate and sports hospitality company. Another eight men were also listed on the charge sheet, RTÉ News reported. Speaking to the Irish national broadcaster, Mr Kac said the judicial process could take as long as two years before the case came to court. He said it was very possible the passports of Mr Hickey and Mr Mallon would be returned to them, on the expectation they would come back to the country when the case reached court. Mr Mallon met police for further questioning on Monday and Mr Hickey is expected to be questioned again on Tuesday. In a statement, the Hickey family said: "Our dad, Pat Hickey, will not be making any comment in the police station at his pre-arranged questioning. "He will be invoking his constitutional right to silence because the Brazilian police have released documents to the media that Pat's lawyers have had no access to."